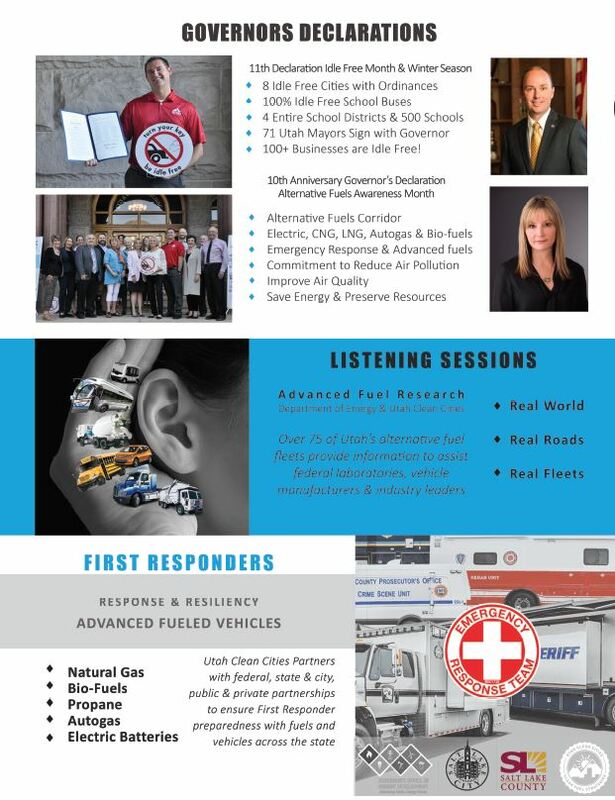 Utah Clean Cities Joins Nationwide Call for Clean Fuels and Vehicles at Energy Independence Summit 2019 in Washington, D.C. NOTE : Utah Clean Cities is available for telephone interviews from Capitol Hill on February 12, 2019 or later to report on meetings with our Members of Congress and their staff. Salt Lake City, Utah– Representatives from Utah Clean Cities will join clean transportation leaders from across the nation next week in Washington, DC to educate federal policy makers about the need to expand America’s use of alternative fuels, including biofuels, electricity, natural gas, and propane Autogas. Tammie Bostick, in addition to being the director or Utah Clean Cities, serves on the Utah Governor’s Motor Vehicle Review board and currently serves as Vice President of Operations for the national board with Transportation Energy Partners. Bostick and key stakeholders will participate in the Energy Independence Summit 2019, the nation’s premier clean transportation policy event, on February 11-13, 2019. Follow along with the bills Utah Clean Cities is tracking this year throughout the 2019 Utah State Legislative Session. HB107 allows the Utah Public Service Commission to authorize a large-scale natural gas utility to establish programs that promote sustainable energy solutions. A large-scale natural gas utility’s spending would be capped annually at $10M. The cost impact to customers would not be significant. For example, if the utility invested $15-$30M in infrastructure to support RNG production and CNG station infrastructure, the cost to the average Utah residential customer would be approximately $0.16 – $0.33 per month. Rep. Angela Romero (D-Salt Lake City) is bringing back a bill that simply ran out of time last year. Her Motor Vehicle Emissions Amendments bill, HB 139, increases the fines for diesel truck owners who intentionally tamper with the emissions controls of their engines to emit plumes of black exhaust from their tailpipes. A first offense is increased from $50 to $100, and a subsequent offense increases from $100 to $500. It is illegal for excessive visible exhaust to be emitted from vehicles that have removed or altered the emissions controls. This bill will help strengthen the existing law by requiring a stronger line of communication between law enforcement who gives a citation, to local health departments who run the emissions inspection programs. Offenders will be reported to the health department, which will, in theory, flag a visual inspection when the vehicle is brought in for its emissions inspection. Idle Free is a popular air quality campaign in Utah. It’s simple and straightforward: Don’t idle. Eight Utah cities currently have an idle-free ordinance on the books: Salt Lake City, Park City, Logan, Alta, Holladay, Murray, Sandy and Cottonwood Heights. More cities are interested in the program, but are hindered by enforcement issues due to an ambiguous 2012 state law which many say defeats the intended purpose of reducing emissions from idling vehicles. Rep. Patrice Arent (D-Millcreek), is running HB 148, which will repeal the idling provisions written in this state law. Last year, Representative Steve Handy (R-Layton) ran a bill that would help address a significant source of air pollution in our valley—pollution from freight switcher locomotives (See CATALYST, March 2018). Freight switchers are locomotives that shuttle train cars around rail yards before they’re shipped across the country. Each unit comes with a price tag of over $1.5 million and a useful life of up to 60 years. The ones operating in our non-attainment areas are extremely dirty tier 0 and tier 0+ engines. The current standard for these locomotives is 80-90% cleaner, but under the Clean Air Act, the state can’t require the companies that own and operate them to upgrade to a cleaner engine. Representative Handy is addressing air pollution from freight switchers with two bills this session. He is bringing back his bill from last year, HB 98, which will create a funding mechanism to upgrade up to three of these engines. He is also bringing a separate resolution, calling on the Environmental Protection Agency to set stricter emissions standards for locomotives. This resolution, HCR 003, acknowledges that the Clean Air Act prohibits states from adopting more stringent emissions standards for switcher locomotives, and recognizes that higher emissions standards for these locomotives would reduce harmful air pollution in our non-attainment areas. UCC Goes to Washington D.C. When private and public sector, government, social, and altruistic leaders apply pioneering partnerships and technologies to address social challenges and build sustainable communities, we experience the multiplier effect. The shared alliances we create generate an energy that seemingly doubles each time we focus on the solutions, wrestle the problem, fail, re-think the failure, and take action with a successful model. We work for this success and to move on to the next innovation. We need to move faster. What was the multiplier effect in 2018? Advanced transportation became a real contender, a force to reckoned with offering real solutions and actionable steps to reduce oil dependency in transportation. 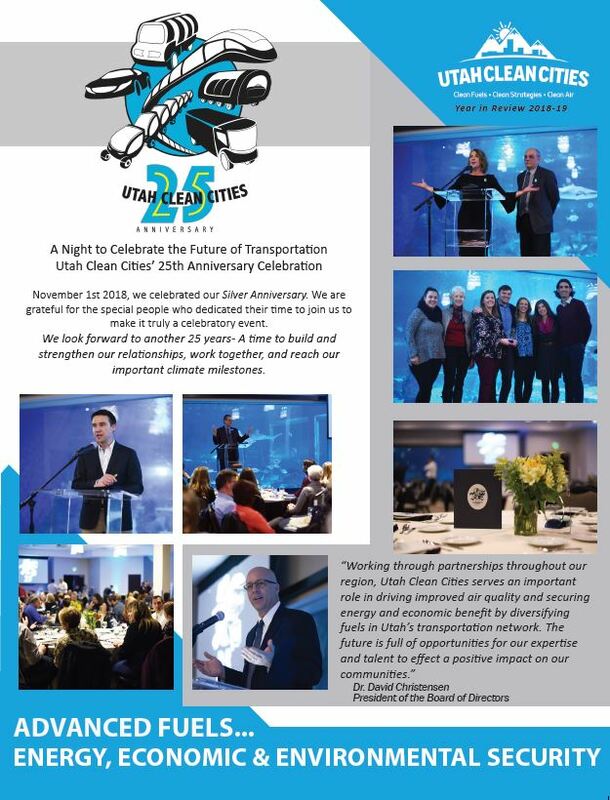 This year Utah Clean Cities celebrated our Silver Anniversary. Almost three decades of work to build smart mobility models with a mission of energy security, transportation decisions made locally, resource conservation, petroleum reductions, and continued advanced, clean, and ideally renewable, technologies for fleets. Working fleets in America use more than 50% of all transportation oil and further these fleets are tasked with delivering all the goods and services to Americans. They are still largely running (90%) on the dirtiest fuel: diesel. Despite our celebratory milestone and hard work we found ourselves in resistance, we almost lost our Clean Cities programs after 25 years. It was slated to be de-funded. Clean transportation was on the chopping block and the CAFÉ standards where openly challenged. We got busy; REALLY BUSY! Our coalition of partners generated tremendous support in the form of letter-writing, emails and phones calls to our local leaders and delegates in Washington. We fought to continue the work of advanced transportation deployment and fuel technologies. It makes sense for our environment and economy (Investment in Alternative Fuels Creates American Jobs) and that continues to be proven despite rhetoric in the contrary. Transportation can be clean and it can, and does, have a sound business model for success. Big oil lobbyist were struggling in Washington as they watched their market share of “oil only” shrink with renewable fuels from methane capture from wide varieties of feedstocks; energy developments with solar, wind, hydro, geothermal; huge advancements with electrified transportation, with batteries, charging and OEM manufacturer commitments, and hydrogen is ready for the market: in general BIG innovations with high efficiency, low carbon, high tech, clean fueled transportation. In 2018, we worked tirelessly with the federal Appropriation Committee and asked them to continue fund the Department of Energy programs such as Clean Cities; we were all on the chopping block in the clean fuels world. After several important and pivotal meetings with many bi-partisan delegates, we receive full funding for another year. In fact, they doubled our funding thanks to our collaborators, Transportation Energy Partners (TEP); of which Utah Clean Cities supports and serves on the national board. Our mission for clean transportation is more possible today than any other time in history. Technologies have advanced beyond early adoption. Today we have the keys to over 650 advanced-fuel vehicles and fully-loaded corridors with high-tech energy options for fueling. Utah joins the nation with clear commitment for clean transportation. With our dedicated Utah Green Fleet partners, regional and national allies we continue to make a difference. The mission of the Utah Clean Cities Coalition is to advance the energy, economic, and environmental security of the United States by supporting local decisions to adopt practices that reduce the use of petroleum in the transportation sector. Working closely with the Department of Energy’s Clean Cities programs, federal and state government, as well as our local stakeholders, we leverage our resources to bring funding into Utah to support the development and deployment of advanced fuel infrastructure and vehicles with an emphasis on renewable energies and technologies. We are committed to expanding transportation modeling by offering consultation services to access proven, state-of-the-art technological vehicles and equipment with proven return on investment for smart mobility fleets. We are here to support actionable steps to meet the challenges of our carbon-constrained world, to meet state and federal mandates and implement sound business practices to tackle the serious non-attainment conditions our state. 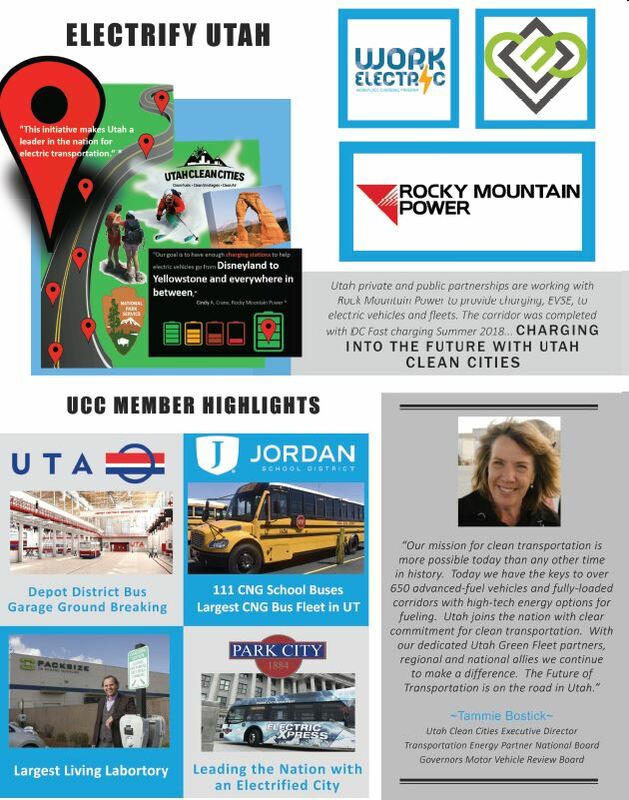 http://utahcleancities.org/wp-content/uploads/2019/02/banner.jpg 612 792 Tammie Bostick http://utahcleancities.org/wp-content/uploads/2017/04/UCC_logo_web.png Tammie Bostick2019-02-06 22:38:022019-02-08 16:57:31UCC Goes to Washington D.C. 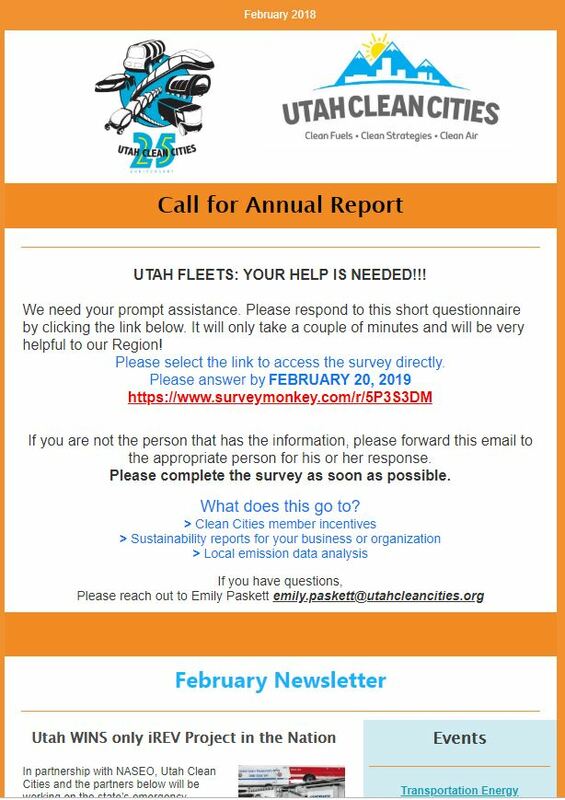 The mission of the Utah Clean Cities Coalition is to advance the energy, economic, and environmental security of the United States by supporting local decisions to adopt practices that reduce the use of petroleum in the transportation sector. Working closely with the Department of Energy’s Clean Cities programs, federal and state government, as well as our local stakeholders, we leverage our resources to bring funding into Utah to support the development and deployment of advanced fuel infrastructure and vehicles with an emphasis on renewable energies and technologies. We are committed to expanding transportation modeling by offering consultation services to access proven, state-of-the-art technological vehicles and equipment with proven return on investment for smart mobility fleets. We are here to support actionable steps to meet the challenges of our carbon-constrained world, to meet state and federal mandates and implement sound business practices to tackle the serious non-attainment conditions our state. 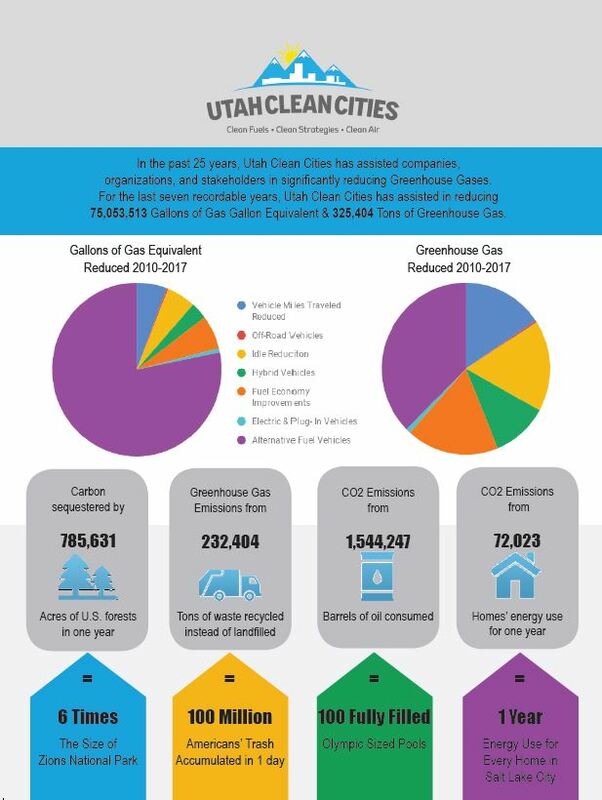 In 2018, Utah Clean Cities has been busy, busy, busy! View our 2018 Year in Review below.